Steve Issis, the owner and founder of Issis & Sons, placed a Steinway baby grand piano in the great room to honor the Alabama Symphony. The design experts at Issis & Sons Furniture Gallery feel strongly that your home should be a reflection of who you are. “Your rooms should have your personality – not the decorator’s,” said Nancy Gowens, the company’s operations manager. She and Issis & Sons owner and founder Steve Issis kept that philosophy in mind as they set to work transforming the great room in this year’s Decorators’ ShowHouse. 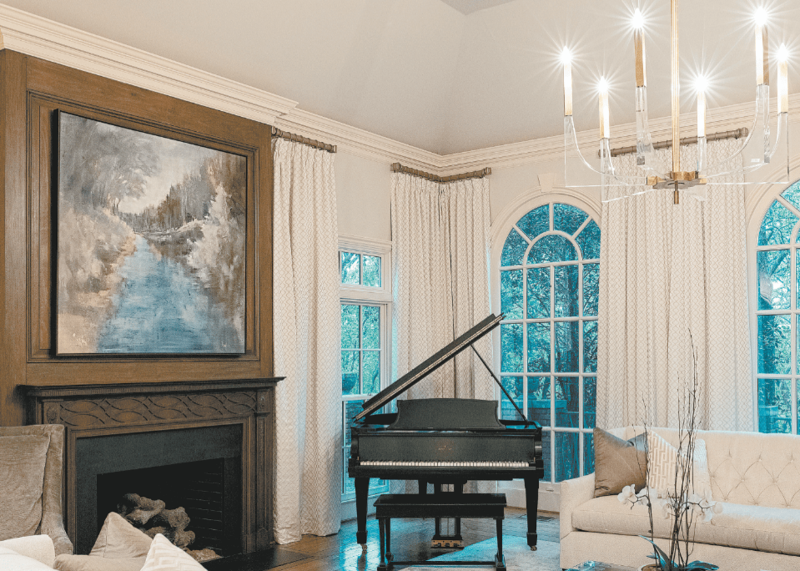 The house benefits the Alabama Symphony Orchestra, so the pair created a harmonious space that sings with style. One piece in the room pays special tribute to the Alabama Symphony. Steve Issis brought in a Steinway baby grand piano that was hand-built in 1911. Musicians will play it during the tour. She said one reason Issis & Sons wanted to design the great room is that it’s “the heart of the house.” In planning the room, she also considered the style of the house itself. She said some of the room’s most appealing features are its architectural elements. Among these are beautiful woodwork, a distinctive fireplace and a wall of tall, arched windows that showcase a garden view. “It’s all about enhancing, not changing, great architectural features,” Gowens said. For example, she chose to show off the arched windows by using shortened rods that prevent the draperies from obscuring the view and that allow for plenty of light to brighten the large space. The soft colors in the room are another way to draw the eye outside. The sofas have gentle curves with tufting and other subtle details. Chairs nearby are large enough to be comfortable but with clean lines. Starting with good-quality upholstered furniture is an easy way for home owners to “build basics,” Gowens said. ShowHouse visitors will want to notice items that give the room polish and style, including the American-made Century and Taylor King upholstery goods, a mirrored console on the wall near the staircase, and the John Richard lamps. “Like putting the right jewelry and handbag with an evening gown, finishing the look is important,” Gowens said. The Issis & Sons team gave the rug special consideration, choosing one that’s durable but still pretty. The rug has a serged edge, a continuous wrap of yarn that produces a custom look that seems hand-sewn. Gowens said Issis & Sons does serging in-house. She said she starts design projects with several questions for customers: What is the room used for? How many do you want to seat? Will it be a casual or formal room? Steve Issis opened the first Issis & Sons in 1983. The original store was a 1,000-square-foot facility in Pelham with a staff of two: Steve and his father, Odeh, who for a while handled all the work themselves. Today, Issis & Sons has four Birmingham area stores: on Pelham Parkway, Greystone Boulevard, Cahaba Valley Road and U.S. Highway 31 in Vestavia Hills. The total space of all four facilities is about 200,000 square feet. Issis & Sons has been a steady supporter of the Decorators’ ShowHouse. For more information about the company, visit issisandsons.com or follow the company on Facebook, Instagram, Pinterest and Twitter. Issis & Sons will offer ShowHouse visitors who come through the great room coupons that are good for 10% off any regular or sales item at their stores.